Tacoma is a mid-sized urban port city in and the county seat of Pierce County, Washington, United States. You'll find plenty of places to visit near Tacoma: Snoqualmie Falls (in Snoqualmie), Bellevue Botanical Garden (in Bellevue) and Pacific Raceways (in Kent). 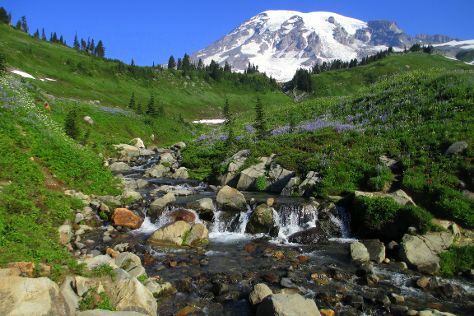 The adventure continues: take in the awesome beauty at Mount Rainier, explore the galleries of Future of Flight Aviation Center & Boeing Tour, see the interesting displays at Museum of Glass, and make a trip to Chihuly Bridge of Glass. To find photos, traveler tips, reviews, and more tourist information, you can read our Tacoma holiday maker . Seattle to Tacoma is an approximately 1-hour car ride. You can also take a bus; or take a train. Expect a daytime high around 50°F in November, and nighttime lows around 41°F. Cap off your sightseeing on the 24th (Sat) early enough to travel to Pocatello. Pocatello is the county seat and largest city of Bannock County, with a small portion on the Fort Hall Indian Reservation in neighboring Power County, in the southeastern part of the U.S. On the 25th (Sun), get engrossed in the history at Fort Hall Replica, admire nature's wide array of creatures at Zoo Idaho, get engrossed in the history at Shoshone-Bannock Tribal Museum, then try to win big at Fort Hall Casino, and finally look for gifts at Poky Popcorn Shop. To see maps, reviews, and tourist information, read Pocatello trip itinerary website . Explore your travel options from Tacoma to Pocatello with the Route module. Due to the time zone difference, you'll lose 1 hour traveling from Tacoma to Pocatello. Plan for little chillier nights when traveling from Tacoma in November since evenings lows in Pocatello dip to 25°F. Finish your sightseeing early on the 25th (Sun) to allow enough time to travel back home.